I didn’t quit smoking for good till years later, but that session in the room largely rid me of my phobia. It seems obvious now that the reason was less any hocus-pocus involving my energy than those words he said, which — however irrationally — lodged themselves in my subconscious. Do I really believe this guy looked at me and saw my fate? No, which is why I didn’t ask him how I was going to die (although I do still wonder if, or how, he would have answered). But it’s amazing how something pronounced in a voice of authority can have an effect on you, even if you don’t actually buy into it. “It’s nice to be listened to,” Nell (Victoria Pedretti) tells Arthur Vance, the handsome and reassuring tech who’s recording her personal history with sleep paralysis — the medical term for the episodes in which she wakes in terror, unable to move or speak, plagued by hallucinations. Like Luke, she’s frustrated that no one has ever taken her problems seriously or offered concrete help. But Arthur (the very smooth Jordane Christie) explains that hallucinations happen because of the “disrupted boundary” between dreams and wakefulness, which lets dreams ”spill over” — just as her father once said. Even better, he helps her come up with a concrete plan to cope with the terrors when they strike. Reader, she marries him — becoming Eleanor Vance, just like her namesake in the novel. Despite the many differences between these two characters, we already know that their fates are virtually identical: a death that might be suicide, in which the house is somehow implicated. This episode, which brings us to the midway point of the season, fills in a lot of missing pieces regarding Nell’s story, especially what happened to her on the night of her death — at least, as she sees it. What we still don’t know is what happened the night the Crains fled Hill House to the godforsaken motel where adult Nell tries to collect herself before her final encounter with the house. I apologize, by the way, for saying earlier that Hill House was in California — I’m not sure why I thought that, but possibly it was because of early press reports that the house in the show was based on the Winchester Mystery House, one of Jackson’s inspirations, too (though far from the only one). Now it becomes clear that Hill House is somewhere in Massachusetts — hence that milk bottle. (So why does Shirley still live so close to it?) We also learn that the year the Crains lived there was 1992, though that wood-paneled station wagon still screams ‘70s to me. “We take care of the house, it takes care of us,” Olivia tells Nell in a scene that reenacts one of the novel’s creepiest moments: the writing that appears on the walls of Hill House urging Nell to come home. Both Hugh and Olivia are showing a real gift for saying things that are true in only the most sinister sense. (Is there any doubt what Hugh is intending when he tells the children he’s “going back for” Olivia?) Carla Gugino’s wide-set eyes have an amazing way of flicking from loving-mom to creepy-mom with barely a change in expression. In the novel, the house itself is a kind of mother, welcoming stray children into its evil embrace. (“Everything so soft. Everything so padded. Great embracing chairs and sofas which turn out to be hard and unwelcome when you sit down, and reject you at once.”) Is it Olivia who will be infected by whatever is in the house and turn against her children? Or is it Hugh, who looks so forlorn and lost in that shot with Nell outside the motel, his clothes covered in blood? We still have no idea. I thought this was the scariest episode yet — I got chills just recounting what happened to family members who didn’t watch — but, as with the Theo episode, I found it just as sad as it was scary. There were so many wonderful moments in the dream/hallucination sequence at the house, starting when Nell says “I’m at home” in the driveway and all the lights go on. (And that shot of the house steaming in the night, as if it were generating its own heat! Whatever it is, it’s not a “carcass,” as the doctor suggests.) All of Nell’s wishes are finally fulfilled, with her parents and siblings saying the things she’s waited all her life to hear. Even the parts of this sequence that take place in the Hill House of her childhood seem warmer, more brightly lit, than those scenes usually are. In the novel, what Eleanor most wants is a home, a place where she belongs and she feels loved. In the show, all we know is that the siblings wound up with their Aunt Janet after their mother’s death, which happened when Nell and Luke — the youngest of the five — were only six. 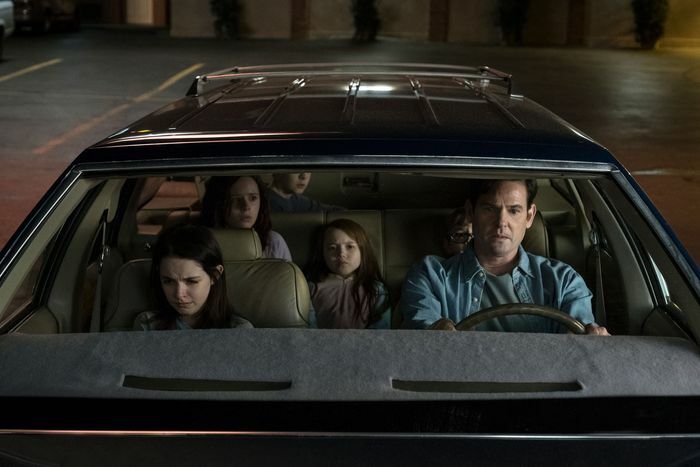 Nell’s nostalgia for her childhood in Hill House, the last time her entire family was together, might be the most haunting thing about the episode. Beneath it all, though, the show repeatedly suggests that we’re our own greatest danger. At least that seems to be the idea behind what happens to Nell, a sequence of events that gets kicked off — or at least exacerbated — by her failure to stay on her meds. (Sure, it doesn’t help that her doctor gives her some really bad advice.) Though there are some inconsistencies — doesn’t Nell see a lot more apparitions than the final images show us? — Flanagan made an inspired choice in rendering that sequence as a time loop, perhaps as another nod to Doctor Who, of which he’s apparently a fan. When it’s impossible to say what happened first, cause and effect become completely jumbled. Which leads me to think that he may be quite happy to leave the deepest mysteries of the house unresolved. • The psychiatrist Nell sees is Dr. Montague, the name of the scientist in the novel who conceives of the idea to investigate Hill House. For both characters, their insistence on rationality gets them in trouble. But why can’t the psychiatrist see that Nell is off her meds? Maybe in season two the Crain siblings will sue him for malpractice. • My absolute favorite scene in the novel is the one where Eleanor, on her way to Hill House, encounters a little girl in a diner who refuses to drink her milk because it’s not in her usual cup of stars. “Don’t do it,” Eleanor thinks, “insist on your cup of stars; once they have trapped you into being like everyone else you will never see your cup of stars again.” The cup of stars turns up in the tea set Nell finds at Hill House, but these lines are spoken by … Mrs. Dudley? Someone had to say it, but it makes no sense that it’s her. • The movie Nell and Arthur watch together is Hitchcock’s To Catch a Thief, which includes a mother and daughter who are troublingly enmeshed (“Mother will love it up here”). • I’m unclear on what the story is with the locket. If Olivia has five children, why does it only contain pictures of Nell and Luke? Nell is wearing it when she confronts Steve at the bookstore; but we also see her receive it from Olivia in the final sequence. It’s impossible to tell if she’s still wearing it in the embalming scene, in which we mainly see her from the chin up. We do see her leave her father’s pocket watch on the dashboard of her car.